Born 3 July 1964, Husein ef. 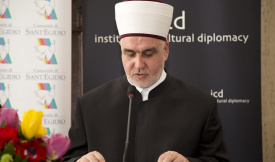 Kavazovic is a Bosnian Islamic cleric and Grand Mufti of Bosnia and Herzegovina. Kavazovic studied Islamic Law at Al-Azhar University in Cairo from 1985 to 1990 and obtained a Master’s from the Faculty of Isalmic Studies in Sarajevo. He first worked as an imam and hen served as mufti of Tulza between 19993 to 2012. 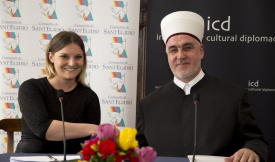 He is an elected member of the Isalmic Community of Bosnia-Herzegovina and member of the Council. In addition, he has been heavily involved in a number of projects on education, introducing religious education in primary and seconday school, founding the Tuzla summer institute in cooperation with Cornell University, and implementing English seminars in cooperation with the US Embassy in Sarajevo and the Ministry of Eudcation Science, Culture and Sport. He has also worked to restore libraries and mosques and helped with the care of displaced persons and refugees from eastern Bosnia. 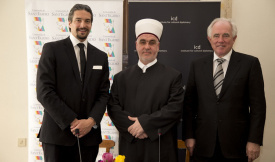 Outside of his religious responsibilities and activism work, Kavazovic has remained involved in the academic world, participating in international Islamic conferences andc ontributing to various publications for the Isalmic Community of Bosnia and Herzegovina.